I'm well aware we have dozens of posts already in the existing US VSTOL Projects topic, but I want to split that one up a bit. Therefore I'm creating this topic, with an image from NASA Glenn image archives. My gosh! Those were the days; six competing companies for a VTOL program. Any chance of a bigger scan of the picture? What's more, the illustration doesn't include the Bell Tilt Rotor proposal, which was arguably proven to be the best candidate from a practicality and performance standpoint for Type A V/STOL, at which point the Navy effectively terminated the program. According to my files, here are the identified contenders for the U.S. Navy's "Type A" design competition. Attached are two little diagrams that show the main contenders and complement the one overscan posted at the beginning of this thread. Here's what was probably the primary Sikorsky response to the Type A requirement. Ultimately was not officially submitted. A bit more on the USN Type A, and the related Type B and Type C requirements can be found in this 1980 Rand report, primarily on pages 14 & 15, although there are other little tibbits throughout the document (note: search function doesn't work for body text, so you'll have to go through it the hard way!). By the way, there's a few paragraphs on the Rockwell XFV-12A (page 43), as well as mention of certain other programs. Another separate little tibbit. In at least one related study, the Type A was also referred to as the 'Projected Future Tactical Aircraft'. A fair bit of info on the Vought primary submission for the Type A requirement, the V-530, as well as it's STOL Attack twin (also referred to as a CTOL baseline), the V-534, can be found throughout this thread. Also in the thread, among other things, is data on Vought's Type B proposals and related work. One of the more unreasonable requirements for the V/STOL Type A was that it be operable from the DD-963 Spruance-class destroyer and fit in the hangar (which was designed to hold two LAMPS MkIIIs, if I remember correctly). This is a fairly large model of the helipad and hangar of this ship. The "powered-lift" contenders tried desperately to kill the tiltrotor as a candidate. One of the features that was condemned as a drawback was the benefit of ground effect on rotor thrust. The knock was that one rotor would lose lift as it moved off the deck, causing a loss of roll control. This demonstrated either mendacity or a complete lack of understanding of the aerodynamics involved. The tiltrotor uses differential collective for roll control. Collective is very responsive and with the thrust out at the wingtips, roll control is excellent. 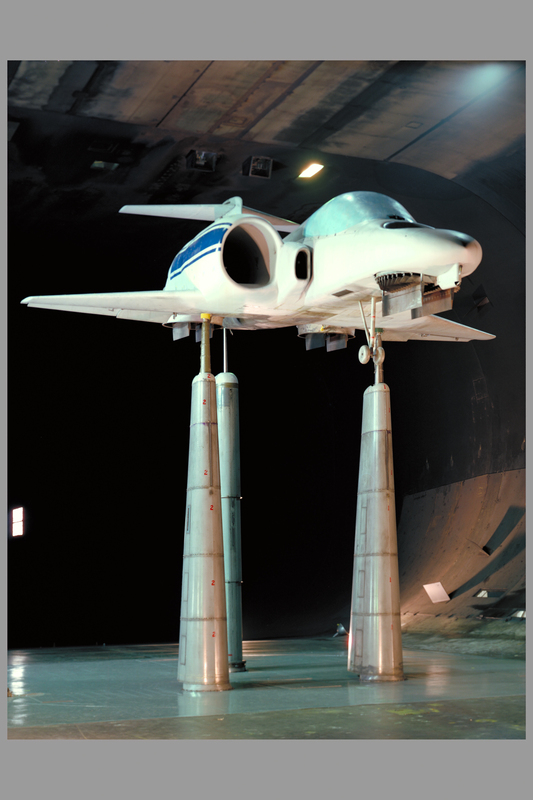 In response to the criticism, Bell built a simulator about the size of half a ping-pong table for trade shows which featured a flying tiltrotor model powered by two electric motors turning fixed-pitch propellers; varying the motor rpm varied thrust. The controls provided were collective (vertical thrust) and roll (differential thrust). It could be flown onto and off of a model of the aft end of a DD-963 by anybody with a minute or two of practice. Although not strictly speaking a valid engineering demonstration, it effectively put an end to the prattle about deck-edge effect. After several merges and splits in the past, this topic is now reserved for discussions and sharing about the US Navy's "Type A" program as a whole or to submit unidentified or ill-documented contenders. In a Vought report describing also the Vought V-530, a second "Type A" proposal is described (presumably also a Vought study). This V/STOL aircraft uses two propulsive nacelles mounted such that total (or effective) thrust in the V-Mode acts through the aircraft C.G. Each propulsive nacelle contains a turboshaft engine driving a high-by-pass ratio fan. The nacelles tilt through an arc of 100°. The moderately high aspect ratio wing is mounted low on the fuselage with the inboard trailing edge section cut out for the tilting nacelle. The conventional fuselage size and shape is determined by the requirements of crew, equipment, fuel volume, and support for wing, surfaces, nacelles, and alighting gear attachments. The wide stance main gear is mounted in pods extending aft from the wing structural box to satisfy tip-over and tip-back considerations. The nose gear mounts and retracts into the fuselage. Roll – Variable inlet guide vanes on each fan allow modulating the thrust differentially between left and right fan thrust. Pitch and yaw — Fore and aft reaction nozzles whose thrust is provided by continuous bleed air from the two engines. A general arrangement of this aircraft is shown in Figure 8. Propulsion system characteristics are presented in Figure 9 and the drive system is shown schematically in Figure 10 with a list of the main propulsion components. The UK also put up some designs, with Hawker Siddeley/BAe Hatfield taking the lead. Pics attached. 2 high res. 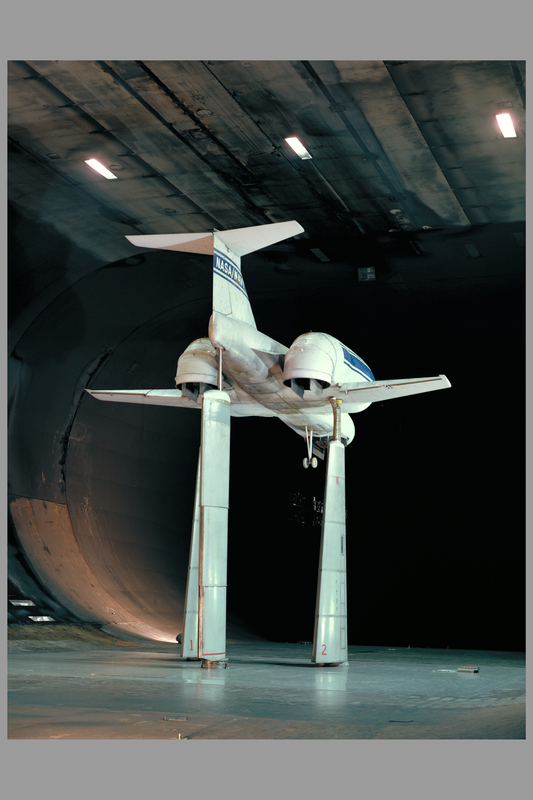 pics of a multi mission lift-cruise fan model in the 40x80ft wind tunnel!...apparently a McDonnell Douglas 260.